Anthropology was a revelation. When I was an undergraduate at Stockholm University, Sweden, my world tumbled as I learned about the range of human diversity. After two weeks in the introductory course, I was hooked, and still am. But it would take many years before storytelling, literature and writing, and dance and visual culture came to the fore in my own research (Wulff 1998, 2007, 2016, 2017a, 2017b). That was the other turning point: when I realized that I could combine anthropology and the arts, my two inclinations—heart and mind—together. Today, writing as the newly elected president of the Society for Humanistic Anthropology (SHA), I’d like to share with you something of how I got here, and why I believe humanistic anthropology remains integral to the discipline. So, how did an anthropologist from Sweden become the president of a section of the American Anthropological Association? My relationship with the United States goes a long way back. Like many other young Europeans, I traveled across the country by Greyhound bus and by car. I lived in New York City (for fieldwork), and in California for periods of time (Wulff 1998, 2017b). At the invitation of Virginia Dominguez and Jane Desmond, I was visiting professor at University of Illinois. I have family in the United States as well. American anthropology became a major point of reference, and I began participating in AAA annual meetings—first as a graduate student giving volunteered papers, then as a session organizer, and finally as discussant. I appreciated the opportunities for intellectual inspiration that AAA provided, its sizable membership, and its numerous and varied sessions. Still, the sheer scale of the AAA Annual Meeting can be intimidating. This is why active involvement in a section such as SHA is important: it allows one to navigate the breadth of the meetings. I became a member of SHA because I was drawn to its sessions. I felt an affinity there among colleagues and friends who shared my artistic sensibilities and values. We know that artistic understandings can contribute to social change, and that they are craved for—not only in happy times, but when personal and political distress hit, then both for comfort and social analysis. Now I am pleased and proud to be president of SHA. I wish to thank my predecessor, Jonathan Marion, for being such a committed and skilled president. Marion saw to it that SHA has a hospitality suite at the AAA Annual Meetings, where members and their friends can meet at organized events and spontaneous get-togethers. This I intend to continue. I also hope to work on the idea of organizing mid-year meetings, possibly as webinars. Let me also mention Julia Offen, SHA treasurer who is herself a treasure. Her long-term experience at SHA is invaluable. To this end, SHA sponsors posters, individual papers, panels, and other expressive formats in the spirit of humanistic anthropology. In particular, we focus on papers and sessions that challenge the disciplinary boundaries of anthropology as a social science and apply alternative, humanistic approaches ranging from philosophy and history to creative writing and performance. This includes our popular ethnographic writing workshops that are taught by renowned anthropologist-writers. It is also in this spirit that SHA publishes the bi-annual journal, Anthropology and Humanism, excellently edited by David Syring and Jeffrey Ehrenreich. The journal includes academic articles and book reviews, as well as short stories, poetry, creative nonfiction, drama, and visual imagery. An annual highlight of SHA are the three awards in writing that are presented at SHA’s business meeting at the AAA: the Victor Turner Prize in Ethnographic Writing, the Ethnographic Fiction and Nonfiction Prize, and the Poetry and Fiction Prize. The winners get to read a piece from their awarded work, which adds flavor to the event. The prize ceremony in 2018 concluded with an “open mic” for anyone to go up and read a short story or a poem. Perhaps some of what we heard there might be submitted to the writing contests for this year? For an update on deadlines for submitting work for 2019, and for a listing of the other 2018 awardees, see our website. I look forward to working for SHA, and to welcoming new members! Helena Wulff ([email protected]) is the President of the Society for Humanistic Anthropology. She is a professor of social anthropology at Stockholm University. Her research is in the anthropology of communication and aesthetics, based on a wide range of studies of the social worlds of literary production, dance, and visual arts, and currently, on migrant writing on Sweden. Rose Wellman ([email protected]) is contributing section editor for the Society for Humanistic Anthropology and an assistant professor of anthropology at the University of Michigan-Dearborn. The Society for Humanistic Anthropology (SHA) announces the annual juried competition for the Victor Turner Prize in Ethnographic Writing. The late Victor Turner devoted his career to seeking an accessible language that would reopen anthropology to the human subject, and the competition recognizes the innovative books that further this project. 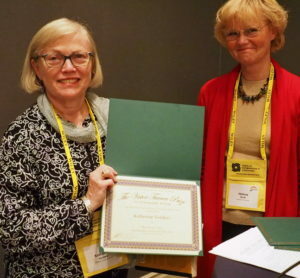 A $1,000 first-place, a $500 second place and a $250 third-place prize will be awarded at the annual meeting of the American Anthropological Association in Vancouver, British Columbia, Canada, November 20-24, 2019. Eligible genres include single and co-authored ethnographic monographs, narratives, historical accounts, biographies, memoirs, dramas, creative nonfiction and fiction works, and single-authored collections of essays, short stories, or poems. Book publication year may be 2017, 2018, or 2019 (through the submission deadline). Books may be entered into the competition by authors, publishers, book editors, or colleagues. No formal letter of nomination is needed. Books published in 2017-2018 entered in last year’s competition may be resubmitted this year with the appropriate entry fee. current affiliation (university or otherwise). Biographical information will be used for presenting the winners and publicizing the results of the competition and will not be used for judging the quality of the entries. Entrants may also include an optional short statement about intellectual training/ orientation, and the circumstances surrounding the research/ writing of the book. The deadline for receipt of all required materials is April 1, 2019. The Society for Humanistic Anthropology is delighted to announce the winners of the 2018 Victor Turner Prize for Ethnographic Writing. We are grateful to the work and commitment of the book prize committee: Julia Offen, Helena Wulff, and Anna Tsing. The committee evaluated over 75 ethnographies for their originality, innovative methods, experience-near approach, quality of writing, presentation and engagement with humanistic anthropology and anthropological scholarship in general. We chose the ethnographies that we found to be exemplars of the best ethnographic writing, the ones destined to make a significant impact on the doing and writing of ethnography. The winners exemplify the broad and deep diversity of anthropologists’ approaches to their craft. Still writing? Summer bringing out your muse? We’ve extended the deadlines for the SHA poetry (July 1) and prose (July 2) competitions. Submit something today! Or next month! Submission deadline is July 2, 2018. Submissions must be previously unpublished and not currently under consideration elsewhere. Winning entries and honorable mentions will be recognized in a ceremony at the annual meeting of the American Anthropological Association in San Jose, CA 11/14/2018 – 11/18/2018. Deadline: July 1, 2018. There is no entry fee for this competition. Melisa “Misha” Cahnman-Taylor, Professor of Language and Literacy Education at the University of Georgia, is the author of Imperfect Tense (poems, 2016), and co-author of three books in educational inquiry. She is the winner of three 2015-2018 NEA “Big Read” Grants, the Beckman award for “Professors Who Inspire Social Change,” and a Fulbright scholarship. Misha is poetry editor for Anthropology & Humanism and has judged the journal’s annual ethnographic poetry competition since 2005. Nomi Stone is a post-doctoral research fellow in anthropology at Princeton University. Her second collection of poems Kill Class is forthcoming (Tupelo Press 2019). Her poetry is widely published, appearing recently or soon in POETRY, American Poetry Review, and Best American Poetry, amongst others. Her ethnography in progress, Human Technologies and the Making of American War is a finalist for the University of California Press’s Atelier Series. Ather Zia is an Assistant Professor of Anthropology & Gender Studies at University of Northern Colorado Greeley. Her first collection of poems “The Frame” was published in 1999 and since she appeared in a variety of noted poetry journals. In 2013 she won the second prize for ethnographic poetry on Kashmir from the Society for Humanistic Anthropology. Ather is finishing her ethnography on Kashmir, and an ethnographic poetry collection titled, “Field In-verse.” She is also the founder-editor of Kashmir Lit and co-founder of Critical Kashmir Studies. A $1,000 first-place, a $500 second place and a $250 third-place prize will be awarded at the annual meeting of the American Anthropological Association in Vancouver, British Columbia, Canada, November 20-24, 2018. Eligible genres include single and co-authored ethnographic monographs, narratives, historical accounts, biographies, memoirs, dramas, or single-authored collections of essays, short stories, or poems. Book publication year must be no earlier than 2016. Books may be entered into the competition by authors, publishers, book editors, or colleagues. No formal letter of nomination is needed. Books published in 2016-2017 entered in last year’s competition may be resubmitted this year with the appropriate entry fee. The deadline for receipt of all required materials is May 1, 2019. The room # is pending, but please join us for any of the following events while attending the AAA meeting in DC this week! 10-6: Available for socializing — get in touch with us!